First rumoured all the way back in 2011, speculation was rife around what we might expect from an Apple Watch. Apple, however, kept quiet, and said nothing until they were ready, which turned out to be three years later. 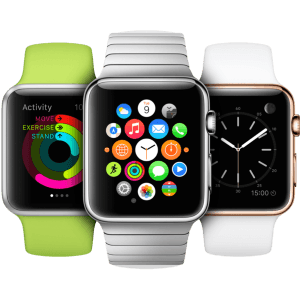 After considerable hype from Apple CEO Tim Cook in autumn 2014, Apple’s wearable tech was finally launched in April 2015. Its primary goal was “To free people from their phones”, by bringing them the apps and functions they love without reaching for their iPhone handset. As for how it’s doing – well, that depends on who you listen to. Canalys, an analysis firm, said it was the best selling wearable tech of 2015, while others have pointed out that Apple have not released any definitive sales figures, and that people should draw their own conclusions from that. For fitness fans, there are Watch versions of several favourites. Strava, which integrates with many other apps, takes advantage of the watch’s GPS and monitors your speed, heart rate, and elevation when in use. Runtastic, at £3.99, has received praise for being one of the most comprehensive workout apps available for the Watch, but is probably targeted more at those who take their fitness seriously, as opposed to the casual dog walker. Like to take your workouts more slowly? Pocket Yoga is the instructor on your wrist, giving you yoga positions, timing each position for maximum benefit, and the calories you’ve burned.